This volume seeks to re-energise the paradigm of the New International Labour Studies by detailing how struggles over the construction, reproduction, utilisation and restructuring of labour forces are the contested social foundations upon which the global economy stands. Through a combination of theoretical works and a series of case studies, the volume highlights the cutting edge of international labour studies. 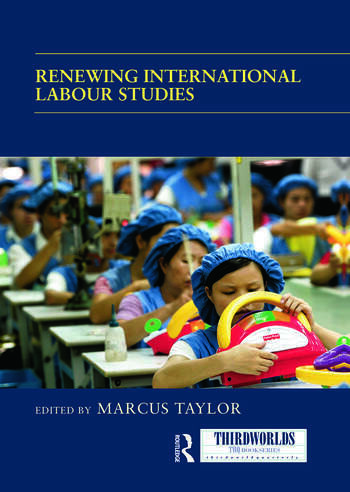 Its expands on three pivotal areas of study within the discipline:1) the social construction of new labour forces across an expanding international division of labour; 2) the self-organising potential of workers, particularly within non-traditional sectors; and 3) the possibilities for transborder labour movements to help address the asymmetrical power relationships between globalised capital and localised labour. In addressing these themes, the volume helps explain not only how the contemporary international division of labour is produced and reproduced, but also the strengths and limits to current attempts to overcome its unequal and divisive nature. This book was published as a special issue of Third World Quarterly. Marcus Taylor is an Assistant Professor in the department of Global Development Studies at Queen’s University, Canada. He is the author of From Pinochet to the ‘Third Way’: Neoliberalism and Social Transformation in Chile (Pluto, 2006) and contributing editor of Global Economy Contested: Power and Conflict Across the International Division of Labour (2008).